Looking for a church interior contractor? The church sanctuary or church nave within the church building is the place we gather and worship our Lord. For this reason church interiors are designed to inspire awe. This may be accomplished through a high church ceiling, gold leafing, murals and religious icons. These artistic expressions of faith work together with the practical needs of the modern church to create a worship experience. Inspired Heights are church renovation specialists who treat their work as acts of worship. Inspired Heights can perform the plastering and interior painting on your next church sanctuary restoration. Remodeling, renovating and restoring church interiors (church sanctuary / church nave) offer unique challenges, like historic plastering, that most would be church interior painters could not repair. Inspired Heights are the experienced professionals and artisans your church needs for your church renovation and church interior painting project. We set the highest standards for church interiors and their maintenance, repair and renovation projects. Church sanctuary, church nave and church interiors are what we do... The church interior painting contractor who knows church interiors! The high work techniques of Inspired Heights typically allows us to perform your interior church renovation with little or no disruption to services. This includes painting, plastering and repairing tall church walls and high church ceilings. But we do more than just high work, from church furnishings to plastering the tallest church ceiling we are your complete church interior restoration experts. Church sanctuary, church nave and church interiors are what we do... The church interior painting contractor who knows church interiors! A lasting quality paint job for your church interior painting project is dependent upon the plastering and prep work that forms the "canvas" for your church interior. Therefore, your church’s plastering should be performed by experienced craftsman, plasterers or a professional church interior painting contractor with experience in traditional plaster and church interiors. 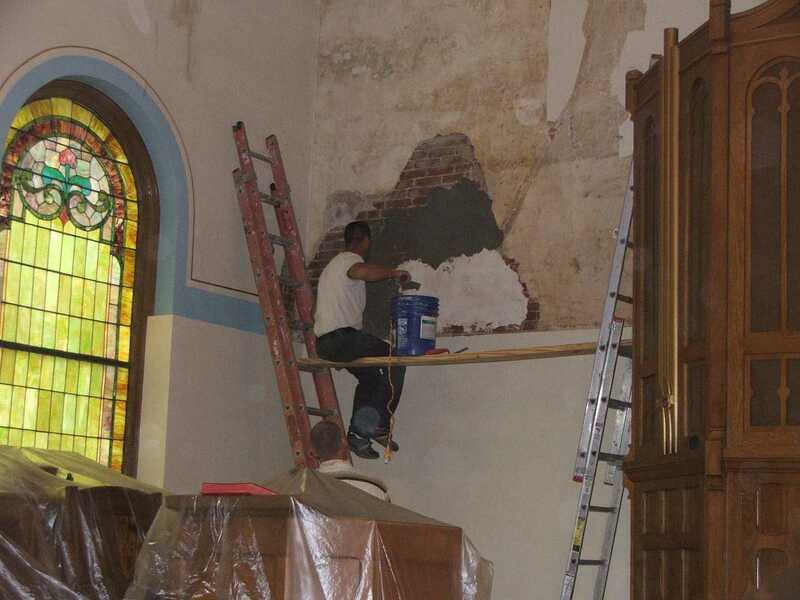 Loose plaster in your church sanctuary / church nave from the church walls and church ceiling must be either re-secured or removed to provide a solid foundation for your church interiors (church sanctuary / church nave) renovation and plastering project. Proper plastering requires that any cracks in your plastering must be dug out and properly filled; surface patching and skim coatings may be unsightly and less durable; therefore, they're not recommended for your church interior painting, plastering and renovation project. 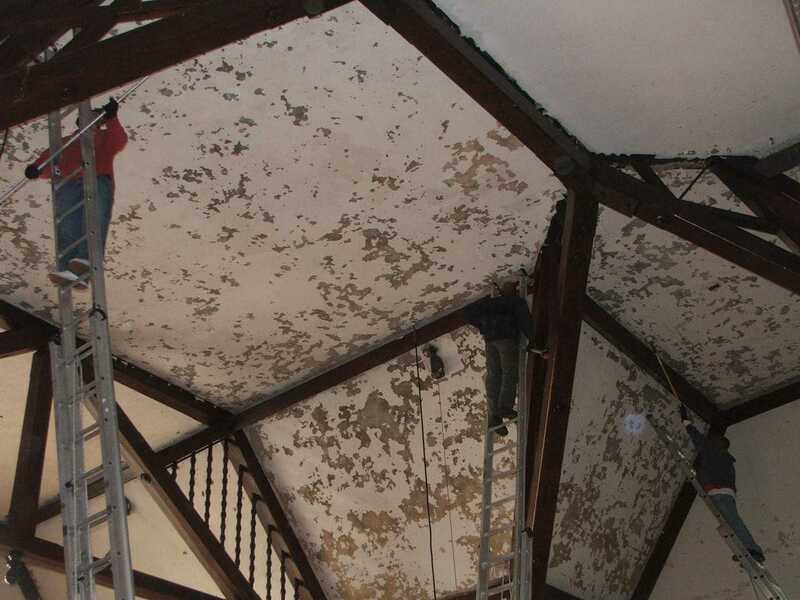 Elastomeric plaster and finish coats provide a durable finish that is more tolerant to the slight movements that are a major contributor to cracks in the church plastering. New plaster should always be primed prior to painting. 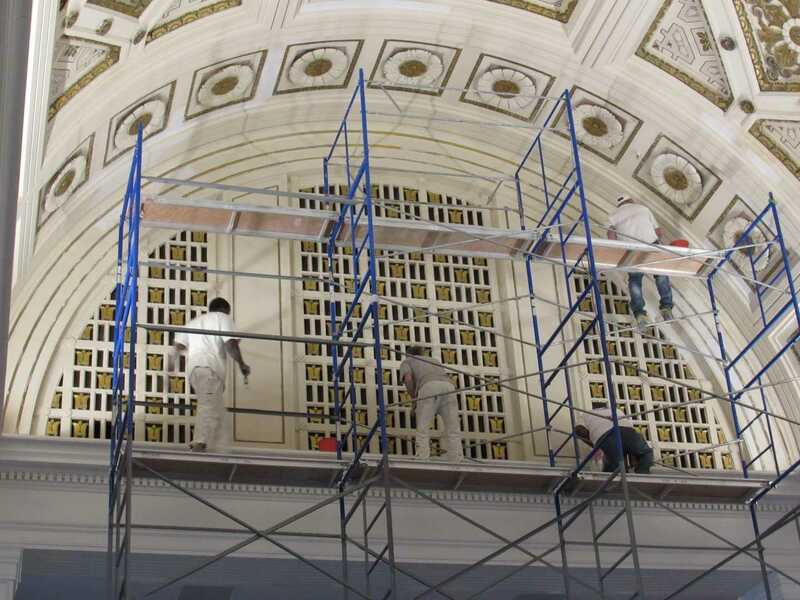 Perform your church's plaster repairs prior to painting your church ceiling and church walls or before painting the church sanctuary / church nave as part of your church interior restoration. Always select experienced painters for your church renovation and church interior painting project! Inexperienced painters are like inexpensive paints, they're never worth the price you pay. Inspired Heights are church painting contractors specialized in the unique needs associated with painting church interiors (church sanctuary / church nave). And we always chose high-quality paints that provide better coverage and last longer. A church interior painting contractor who goes with a lower-quality paint based solely on the price tag will probably end up costing the church more money in the long run because you’ll have to apply more coats and repaint sooner. While selecting the colors for your church’s interior painting project is usually a matter of aesthetics the right sheen is vital to the finished look and should be carefully selected based on texture, traffic and lighting. Inspired Heights are church painters that can help your church select the right paints for your interior church renovation project. Liturgical and iconic art is art consecrated in service to God and His Church. More accurately it is Sacred Art, set apart for the honor and glory of God. 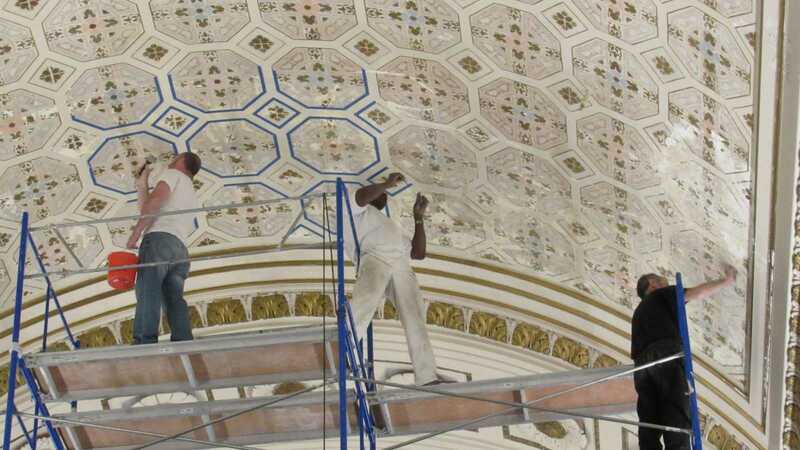 Often located in the church sanctuary / church nave this special form of art requires special painters, church painters who are more than just your typical interior painting contractor. Because of its sacramental character liturgical art has the ability to engage our spirit and soul while connecting us to our Creator. Liturgical Art is an expression of Faith and inspires Faith. Because of the spiritual nature, the liturgical artists of Inspired Heights treat your church’s liturgical art project as we do all our church renovation work… as an act of worship. Additional interior church renovation services offered in restoring your church sanctuary /church nave include: interior painting church ceiling, church walls, gold leaf and stenciling, iconic and liturgical art, gilding, wood refinishing, plastering and plaster repair, church furnishings, carpentry, pew restoration and upholstery, altars, pulpits, lighting and sound systems, etc. 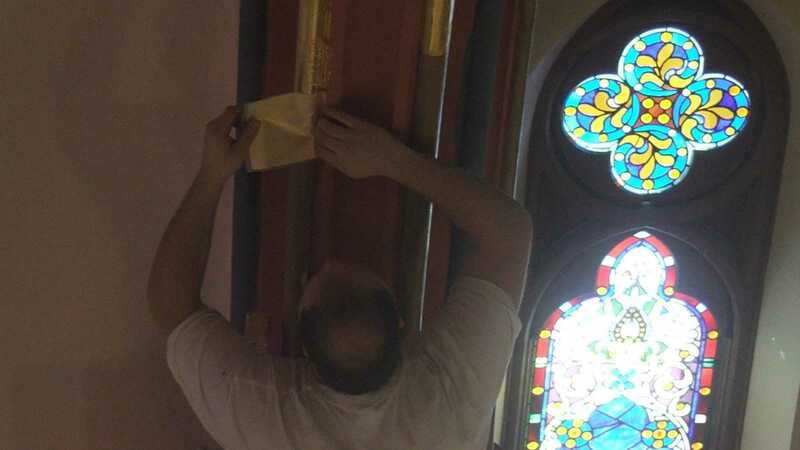 We are complete church maintenance, repair and restoration professionals. Services for ​Church furnishings include: ​painting, staining and refinishing; gold leaf and faux finishes, repair and restoration of the wood, even re-upholstery are part of the unique services we offer for church furnishings. Church furnishings include the pews and kneelers but church furnishings may also include the pulpit and altars. all of which take special care to maintain their beauty. This can typically be done onsite with little to no interference with church functions.